This invention relates to the preparation of molybdenum acid salts. More particularly it relates to a process for preparing molybdenum salts of carboxylic acids by direct reaction of particular molybdenum compounds, with a mono carboxylic acid of from 2 to 35 carbons. A process for purifying concentrates of molybdenum oxide containing a variety of naturally-occurring contaminating metals, such as potassium, copper, calcium, magnesium, iron, aluminum, lead, zinc, bismuth, and the like, as well as compounds thereof, by roasting the impure concentrate at an elevated temperature in an oxygen atmosphere to convert sub-oxides of molybdenum tomolybdenum trioxide and contaminating metal molybdites to corresponding metal molybdates, which are extracted by a hot aqueous leaching of the concentrate and the solubilized molybdate ions are recovered. The aqueous leached concentrate, after separation from the aqueous leach solution, is leached with an ammoniacal leach solution for converting the molybdenum trioxide constituent therein into soluble ammonium molybdate compounds, and the resultant leach solution is removed from the remaining insoluble residue, which is discarded. The ammoniacal leach solution containing only minimal quantities of remaining contaminating metal ions can be further purified by passage through a chelating cation exchange resin, whereafter the ammonium molybdate compounds are recovered, such as by evaporative crystallization, to produce a high purity ammonium dimolybdate (ADM) product, or alternatively, can be calcined at an elevated temperature to produce a high purity molybdenum trioxide product. The present invention relates to a method of selectively removing molybdenum from molbdenum-contaminatecl aqueous tungsten-bearing solutions. An X-ray tube, the anode of which has a molybdenum target, is disclosed. In order to prevent cracks from forming in the target under the effect of electron bombardment, the molybdenum is alloyed with vanadium. A metal-air battery has an anode in which the electrochemically active material is molybdenum. The molybdenum may be in the form of a bulk body of material or it may comprise a particulate material dispersed with or in another material. 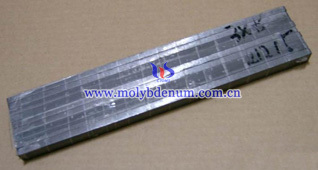 In some instances, the molybdenum may comprise a member of an alloy or mixture. Also disclosed is a modular battery system which may include the molybdenum-based anode material.